In “Mobile Commerce Grows 31 Percent in Q1,” Contributing Editor Armando Roggio addressed the rapid growth of mobile commerce. Following from his article, I experimented with various ecommerce sites, to better understand the status of mobile shopping today. Since much of the growth is attributed to tablets, I used my iPhone. Other than very large retailers, there are few smartphone-optimized ecommerce sites. This prevents higher growth on these smaller devices. 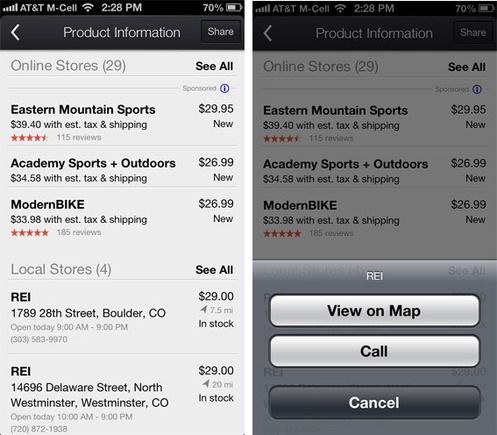 Non-optimized stores are cumbersome on an iPhone as the user is forced to zoom and pan to get to content and buttons. The mobile optimized stores and apps are easy to shop on, especially if you have previously researched the product are ready to buy. The presentation of products for most of these stores is excellent. Adding products to carts and checking out is more than adequate in most cases. Many sites even incorporate promotions and merchandising tactics. Beyond the lack of smartphone optimization, my two biggest observations were the following. Importance of powerful search on mobile optimized sites. Leading sites offer suggested keywords and further filtering once you have results, making it fast to find the items you are looking for. On many sites, categories are hidden from the home page or well below the fold, which further encourages the use of search as the primary navigation. The power of the Google Shopper app smartphones users, especially for buying merchandise from local stores. It’s no surprise that Google understands shopping behaviors. It emphasizes the importance of search in shopping. I’ve casually observed the Shopper app previously, but this is first time I used it in depth. It’s effective for finding a wide variety of merchandise. This article will focus on how the Google Shopper app is likely influencing purchasing behaviors and what you may want to do about it. I shopped for Frisbee golf discs earlier today. I used the Goggle Shopper app to help me find the best item and store. Hence, “Frisbee golf discs” is the basis of this research. Here are the results on the standard Google search app on the iPhone, below. 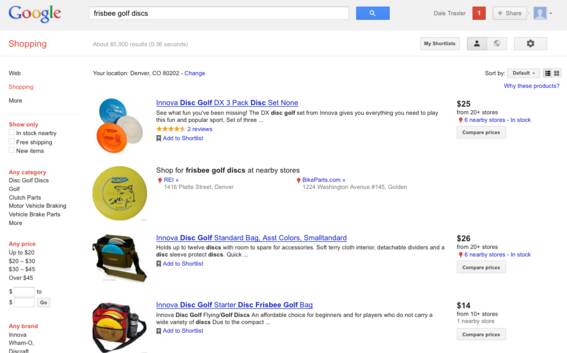 Google Shopper home (on left) and with “Frisbee golf discs” search (on right). The Shopper home screen focuses on Mother’s Day items. The search is as you would expect. You can also scan a bar code or enable the microphone on your phone, to avoid typing. 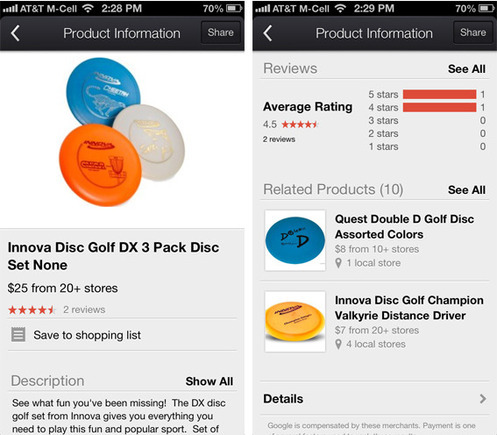 The search results for “Frisbee golf disks” are concise and include a starting price, the number of stores with the item, including the local stores that may have the item in stock. There are also product reviews. I chose the first choice on the page: the DX 3 Pack. DX 3 Pack product details on Google Shopper. The DX 3 Pack product image is crisp and visible. There is a brief description that also can be expanded to show more details. The bottom of the detail listing includes an overall rating and related products. Just under the description, in the image below, are the stores that stock the item. Detail levels are appropriate with (a) the estimated total price, including shipping and tax, (b) new or used, and (c) ratings. The biggest eye opener to me was the local listings. 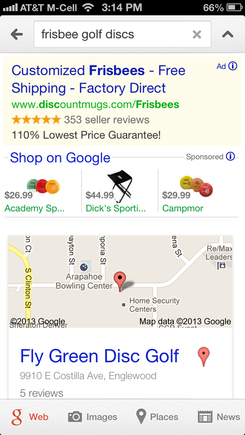 I did not think of Product Listing Ads in Google Shopping as a tactic for local merchants. But it’s a very good one. Since I wanted these Frisbee discs to arrive soon, I clicked on the REI near my office and called the store directly from Shopper. REI did, in fact, have the item in stock. I purchased the item there. Before that, however, my daughter went to several local stores looking for these discs. I likely would have purchased online from one of the other stores if the local option had not existed within Shopper. REI’s Product Listing Ads, therefore, were a well-placed investment in this case. 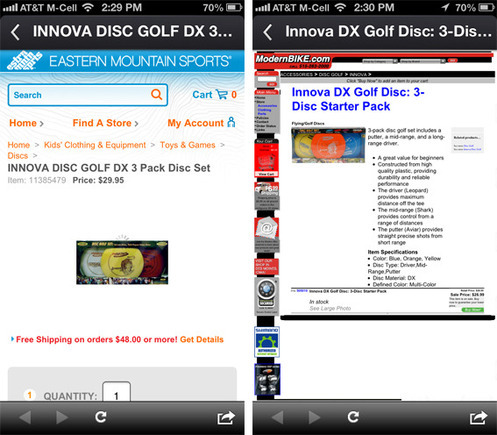 Stores that carry DX 3 Pack Frisbee golf discs, including local stores. Now, consider the product details from two of the stores when you click through from this listing. Smartphone-optimized Eastern Mountain Sports (on left) and non-optimized ModernBIKE.com (on right). The left screen from Eastern Mountain Sports is optimized for a smartphone. The image is smaller than it needs to be, but the rest of the site is optimized. The store on the right, ModernBIKE.com, is not optimized. 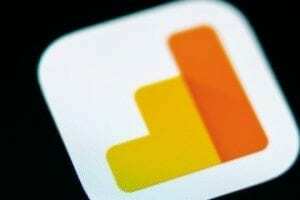 I’m more likely to shop the optimized store unless the price is dramatically different. 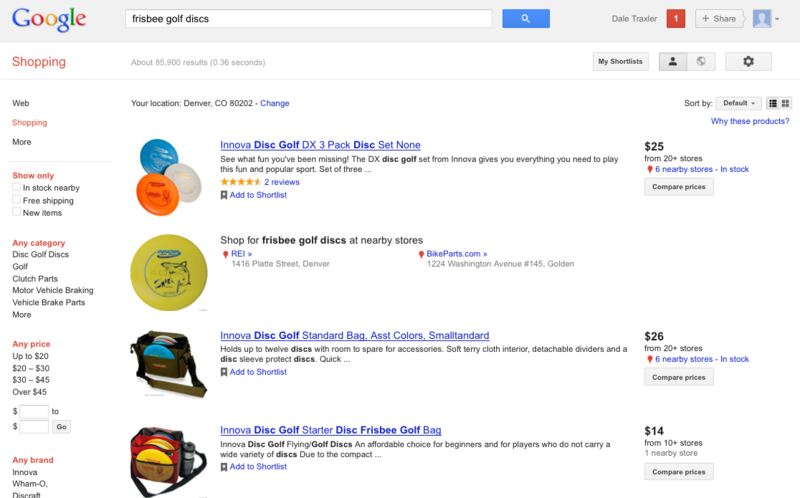 Google Shopping is similar to other comparison-shopping engines like TheFind, Shopping.com, and Nextag.com. Amazon’s Product Ads serve a similar purpose. Google Shopping is available on any browser and is optimized for your device. 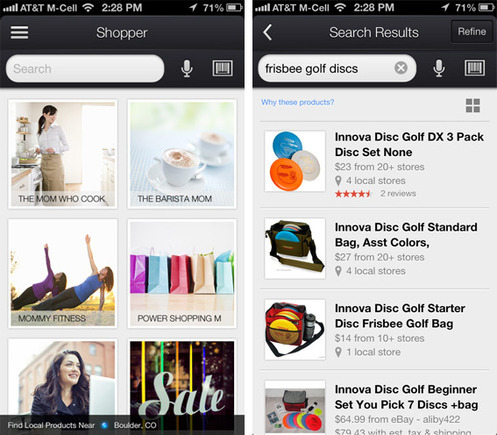 Shopper is the app for Google Shopping for smartphones. The same products appear in both venues. The same products may also be used in PLAs within the standard Google search engine. Here is an example, below. Search results on Google Search app on iPhone. Notice the images above the map. Those are Product Listing Ads from some of the same stores that appear in the results from the Shopper app. They are links to a single product within a single store rather than to a product as you would see using Shopper. PLAs are created from a data feed that you send to Google. They may be used to feed ads in the Google search network or in Google Shopping. They are all paid ads. You will pay only when someone clicks on your ad. To learn more about how to implement PLAs, watch our recent webinar, “Google Shopping: Optimizing for Maximum Profits.”. Within PLAs, include your entire product content, optimized for the PLA itself. Include short descriptions and images that are appropriate for where you will be presenting the PLAs. Segment your products and tag them in various ways for merchandising. If you use PLAs and turn on campaigns for smartphones, you need a mobile optimized site. Shoppers on smartphones are usually in a buying mode. They will likely opt for the easy-to-use interface if they are ready to buy. As Google expands its influence with local merchants, which is significant already, we may see more of them invest in PLAs to draw in local shoppers for immediate purchases. This will put more pressure on online merchants to offer a price advantage with fast, free shipping. I’ve included, below, one final screen shot of Google Shopping on the desktop, which includes more details and filter options. Google Shopping, in short, is a good, consolidated place to shop. I’m impressed with the Shopper smartphone app. Google Shopping is a viable place to shop for items online. In time, Google Shopping could rival the product selection on Amazon.com. We’ll see.